New short film highlights vapers' struggles to get e-juice. 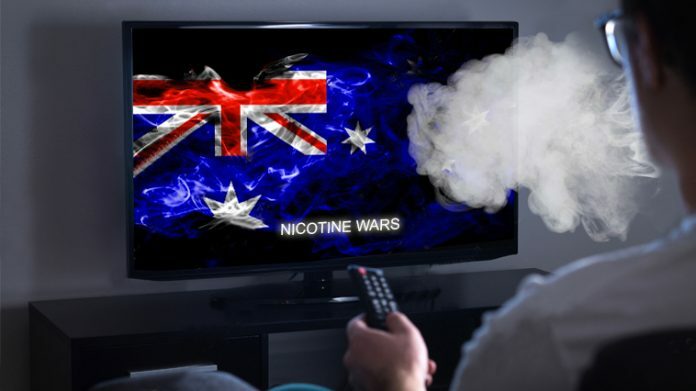 The online video, “The Nicotine Wars: Vaping and Mental Illness,” was shared by the Australian Tobacco Harm Reduction Association (ATHRA) and co-produced by ATHRA Director Dr. Stephen Elsom and Dr. Natasha Sands. The film is appropriately titled and should be viewed by vapers and smokers, alike. The short film chronicles smokers with mental illness who struggle with Australia’s nicotine ban on e-liquids. It shows how these individuals suffer from the inability to utilize vaping devices, which has proven to be a safer alternative to smoking combustible cigarettes. To satisfy their smoking urges via vapor requires individuals to go through foreign online vendors. What government officials are not taking into account is individuals with mental disabilities often find it difficult to execute such tasks. Also, many do not have the available financial resources to complete such purchases. Others, simply do not have access to the internet. With little aid, their plight continues. Access to a safer smoking alternative remains out of reach. Among individuals with different types of mental illness, such as bipolar disorder, schizoaffective disorder, and schizophrenia, smoking has traditionally been a popular distraction. Reportedly, the number of smokers with a mental illness is at least double compared to the general population. The rates are similar in New Zealand and the United Kingdom. Australia was once recognized as a world leader in helping lower smoking rates among its citizens, aided by high excise taxes and public health campaigns. Over the past few years, however, the quitting rates have leveled off and it reportedly trails countries like Canada and the U.S. in current tobacco harm reduction practices. Vaping advocates proclaim renewed marketing practices could help Australia regroup and display a sense of compassion to a group of people who certainly need it. “The Nicotine Wars” was first presented in Warshaw last June at the Global Forum on Nicotine 2018 Film Festival.